This was the first book on performing magic on a cruise ship. Many magicians realize that one of the more enjoyable ways to earn a living in this profession is to work the cruise ships. The eating is great and you can see the world. You may die from over-eating but what a way to go! If you think you can eat the gourmet food on the cruise ships and still fit into your tuxedo, then this book is for you. The problem for most magicians who desire to work on the cruise ships is lack of information on how to go about it. This ebook details how to get booked, the names and addresses of the agents (they are probably out of date) to call, what to take with you, what to do with livestock, what kinds of acts the agents want, what it should pay, etc. 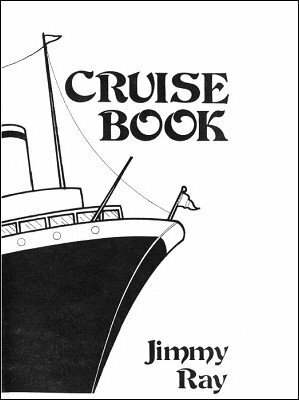 Jimmy Ray, a working professional who has spent years-working cruise ships as well as nightclubs, has been kind enough to reveal his vast store of information on this subject. To someone desiring to get into this line of work this book is easily worth a lot more than the pittance asked. After reading through this concise ebook, any qualified magician with a professional act at least will know what he has to do and where to go to break into the cruise circuit. 1st edition 1980, 32 pages; PDF 24 pages.